With Thanksgiving recently taking place in the USA, I was thinking how lucky I am to live in a country where I have free access to books via our wonderful public library system. And feeling thankful for book shops too. Although online buying is easy, nothing will ever replace the "feel" I get in a book shop, as if I've stepped into a cave filled with treasures. How long is it since you took your kids to a store to choose and purchase a book of their very own? If you can't remember, consider December 3 as a great reminder! It's Take Your Child to a Bookstore Day. "Watch his face light up as you give him free access, not just to a new book, but to tomorrow." Being able to choose a book for themselves gives children a sense of control and ownership over what they're reading. They're more motivated to read, and will learn to refine their own choices as time goes by. If the price of books is daunting, consider getting kids a library card and visiting weekly. Again, make sure they get to choose lots of books for themselves. Another great place to find less expensive books is a market or garage sale. But if you can afford it, do consider visiting a bookstore with your children on December 3! My 6-year-old son and I have a book date every month on the 15th. We go enjoy a cookie while reading some books together there and he gets to pick a couple of books of his own (depending on price), and I pick one for him. I LOVED bookstores as a young adult and I hope he remembers these dates and our special time together. What a lovely idea, Cinda! And I love the way you're conferring ownership on him, yet retaining a suggestion of your own too. It sounds like the best of all possible worlds! Thanks so much for discovering Take Your Child to a Bookstore Day! Aware of the issue you raise, of expense, my dream is to establish a small series of grants in time for next year's celebration in 2012. Children whose families or teachers would like to get to bring them to a bookstore would get to apply for a gift card at their local bookstore, transportation costs, and even lunch out on the Day. Please stay tuned! Jenny, that sounds like a plan indeed! 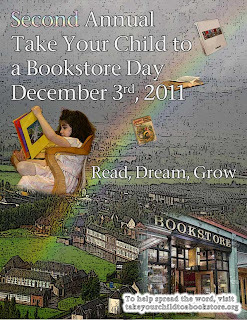 I would love to see Take Your Child to a Book Store Day become an international day too. I'm an Australian, posting about a US special day and had a reader on Google+ from Germany saying the same thing!